Free roaming is used by some enthusiasts and is acceptable providing that you have ensured your hedgehogs safety in every aspect. For the best outcome for you and your hedgehog, it is best if free roaming is limited to one room in your home that you can devote to your hedgehog. Free roaming provides highly ample space for your hedgehog to explore and exercise. This may be especially beneficial for larger hedgehogs prone to obesity. Cageless hedgehogs are likely to be more active than caged hedgehogs. Extra freedom may allow your hedgehog’s personality to be expressed. Keep in mind that if your hedgehog is one of those that will not litter train, you will have urine and feces to clean off your floors on a daily basis. Be extremely careful with carpet cleaners as Lori Keller, experienced hedgehog rescuer, had a terrible experience with carpet cleaning products. You will need to consistently monitor the room for potential dangers. 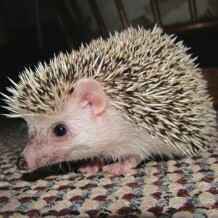 A free-roaming hedgehog is more prone to accidents than a hedgehog confined to the safety of its cage. “Hedgehog-Proofing” is a lot like “Child-Proofing” in which this is a job almost never done. You can hope to provide the most hedgehog resistant room, but your hedgehog will most likely find something that you have missed. Wearing socks or bare feet and not shoes can also help prevent an underfoot accident from occurring. You will need to ensure that adequate temperatures can be provided and that any use of electrical devices are used in the safest way possible. This includes keeping electrical cords out of reach, and that the heating elements cannot be reached by a hedgehog seeking a warm spot. Furniture in the room should be high off of the floor, rocking chairs, glider rockers etc, should not be used for obvious reasons. Couches and upholstered chairs will be used as a hiding spot and if there is a hole underneath in the lining you can be assured that your hedgehog will find it and climb up into your couch or chair. This can result in a squished or trapped hedgehog, and for their safety, are not recommended. For the same reason, reclining furniture should not be in the room. Small items on the floor will need to be watched for as well. Your hedgehog can choke or have an intestinal blockage on buttons, coins, zipper pulls, snaps, paper, paper towels, tissues etc. Paper seems to be irresistible to some hedgehogs and they will chew and consume any they can get to. Not only can they receive a blockage from ingesting paper, the dyes and inks used in the paper could be toxic to your hedgie. Strings and hairs will also need to be checked for daily as these can wrap around your hedgies leg or toes resulting in loss of blood flow, infection and/or amputation of the limb or appendage. You will need to ensure that your hedgie cannot escape the room and that other household pets cannot enter. A hedgehog will climb anything it can get its claws hooked into or that will provide a boost. Be careful about plants in the room, hedgehogs would love to play in the dirt, and may also nibble on the leaves which may be toxic. Even if a plant is up high, leaves and flowers do drop down and may be taste tested by your hedgehog. Your hedgehog will need to have easy access to food, water and litter box at all times, as well as hiding places, and a warm, secure place for sleeping. The above suggestions should also be kept in mind when you are letting your hedgehog loose for out of cage time. Make sure your hedgehog is plenty warm. You need to be concerned about floor temperature rather than the temperature at human eye level. Heat rises and drafts are often on the floor.